Military connectors are used in all sorts of applications, from communications and nav systems to electronic warfare — and as the vision of the “wired” soldier continues to become a reality, new uses, and new needs for military connectors are being created. As you might imagine, military connecters need to be significantly lighter, yet stronger than their civilian, or even commercial counterparts, and with many other propriety features, such as the ability to be quickly released, while leaving equipment undamaged. 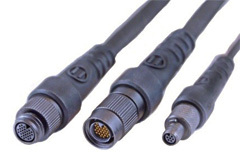 To meet these needs, interconnect engineers have designed smaller quick-release cable and connector systems specifically for the military equipment industry. This new generation of electronic interconnects offer higher speed digital circuitry as well as premium quality signal fidelity throughout the soldier interface. Field office systems can be designed to interface directly and securely without radio interference using these newer micro sized cable and connector shielding systems that match the micro and nano sized connectors. Combat connectors also use unique materials such as copper ethernet cabling – which has the ability to pick up interference and divert it into the ground – and jacket compounds, which among other things, can withstand UV rays and resist damage from mechanical abrasions and cuts. Strength and security have always been important in the development of military grade cables and connectors. Today the trend and the greatest challenge to suppliers is to provide that durability and interference resistance in a smaller and smaller package. Fortunately, early models existed for the evolution of miniature electronics from similar industry challenges. Cell phones, laptop computers and digital cameras all contain high performing chip technology that serves a growing demand and a growing appetite for more functions. Portable test equipment used in telephony for the petroleum industry required better test and diagnostic functions, simultaneously with increased reliability and ruggedness for field applications. GPS modules, missile guidance systems, and other defense and commercial technologies have driven designs for the compact miniaturization required by today’s future soldier modernisation programs. A key factor emerged with the C-MOS chip technology. C-MOS techniques have allowed significant increases in function and processing capacity while simultaneously increasing the density, reducing size and weight and even offering more rugged, portable electronic products. Originally, the C-MOS chips used in portable military technology had to handle electronic circuits using analog technology. Even the earliest digital chips required relatively high voltage and used more electrical current. Now that the signals are predominately digital, new circuit chips do not require the same level of support and protection, Voltages are usually regulated from 12 volts down to as low as 3 volts and less. Current flows have dropped from nearly 3 amperes to ranging in the 100 mill-amp range and lower. Power supplies or batteries are dramatically smaller and lighter in weight, and the interconnection systems within the instruments can be significantly reduced in size. In turn, wiring can be nearly half as large with plenty of capacity for current flow. With lower voltages, the insulator materials in circuits can be significantly smaller and more compact. As a result, miniature connectors and smaller wires solve an additional size and reliability problem for military equipment. High reliability, ruggedness and long life can be achieved as well, if designers use the high reliability standards previously proven in other high-technology applications, such as, military and aircraft circuitry. Over the years, “combat connectors” have become stronger and more durable, battling harsh weather conditions, shock, vibration, extreme changes in temperature, dust, rain and just about anything else the enemy can, and has, thrown at them. Military connectors have not only been up to the task, they have become smaller and lighter, their bandwidth and security have been increased and their energy consumption reduced. They are truly the unsung heroes of the soldier modernisation landscape.